What could be more of a treat than a sugar free chocolate fondue? For this you may wish to use a chocolate fountain or a fondue set. If you have neither then it will work just as well in a saucepan. Remember to keep the heat low though while you are preparing the dish and if you have a food warmer you can place the pan on this in the centre of your table, it will keep the fondue going for longer. When using cocoa powder in a fondue, try to find a nice brand. Look for organic or high quality varieties. It is worth splashing out a little on this dish. Before making your fondue, think about what you will serve up with it. Pieces of fresh fruit such as strawberries, raspberries, slices of banana and squares of mango work well. You can also dip in pieces of sugar free chocolate brownie - but make sure the cake is nice and firm. Remember you will need fondu forks or skewers as well. If you are having a large dinner party you may wish to serve two fondues to prevent people having to lean right across the table.Also think about serving another dessert alongside the sugar free chocolate fondue. Sugar free vanilla ice-cream presents a nice contrast to the hot liquid. 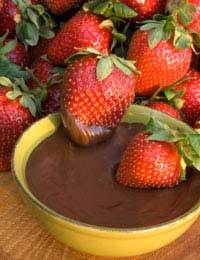 This is a recipe for sugar free chocolate fondue with a twist. Feel free to omit the orange, however, if you prefer your chocolate fondue plain. Heat your cocoa powder, butter and honey in a pan. Once completely melted, stir in your milk. Grate the zest of your both oranges and squeeze the juice of one. Add to your liquid. Stir until you are sure there are no gritty lumps in your mixture then pour into your fondue dish or serve in a pan. Take pieces of fruit, place them on the end of a skewer or fondue fork, dip in the chocolate mixture - and enjoy! This indulgent chocolate fondue is for adults only! Tuck into it with friends after a dinner party or enjoy it in front of a fire on a winter’s night when spending a romantic evening with your partner. Heat your cocoa powder, butter, ginger and honey in a pan. Once completely melted, stir in your double cream. Add the brandy to your liquid. Once again, stir until you are sure there are no gritty lumps in your mixture then pour into your fondue dish or serve in a pan. Take small square of sugar free gingerbread and pieces of fresh fruit, place them on the end of a skewer or fondue fork, dip in the hot mixture.